- All the latest chipsets are, and will be, supported. 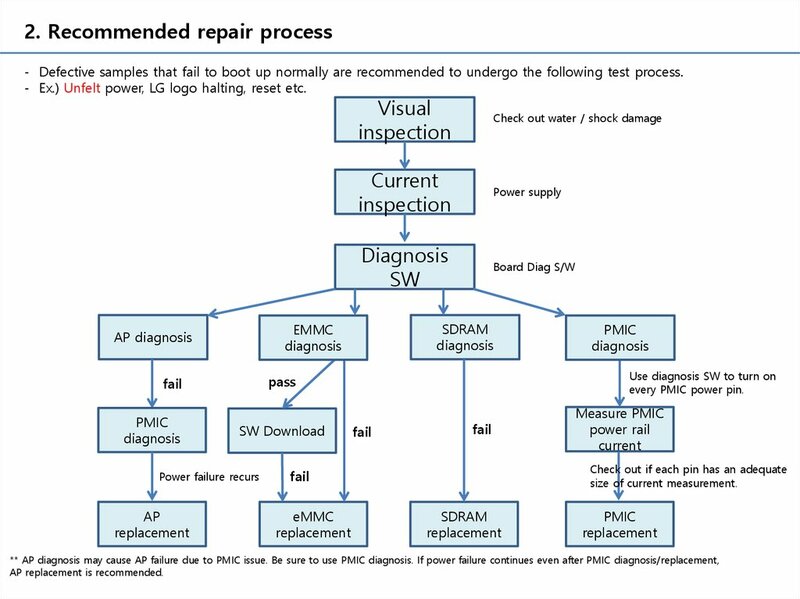 - Defective samples that fail to boot up normally are recommended to undergo the following test process. - Ex.) Unfelt power, LG logo halting, reset etc. - When AP processor fails to boot up normally, it automatically enters Qdload mode. 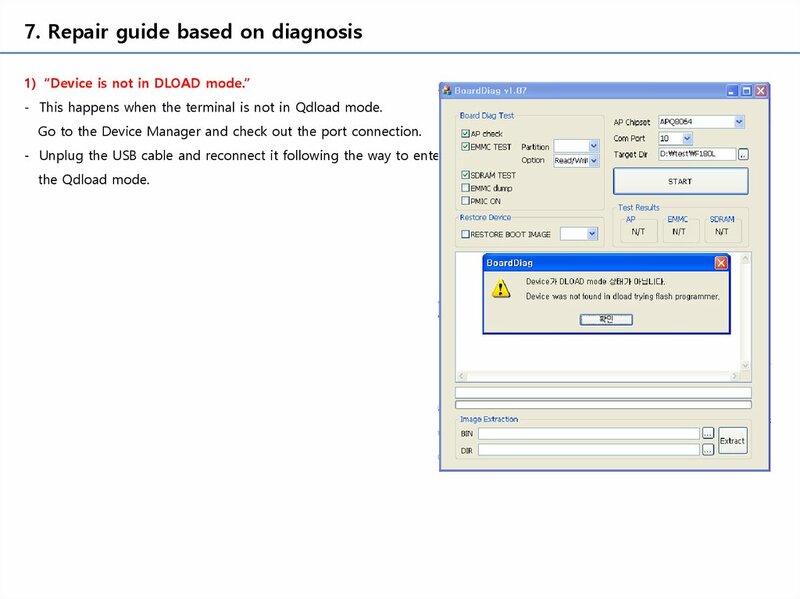 - This mode enables eMMC access. 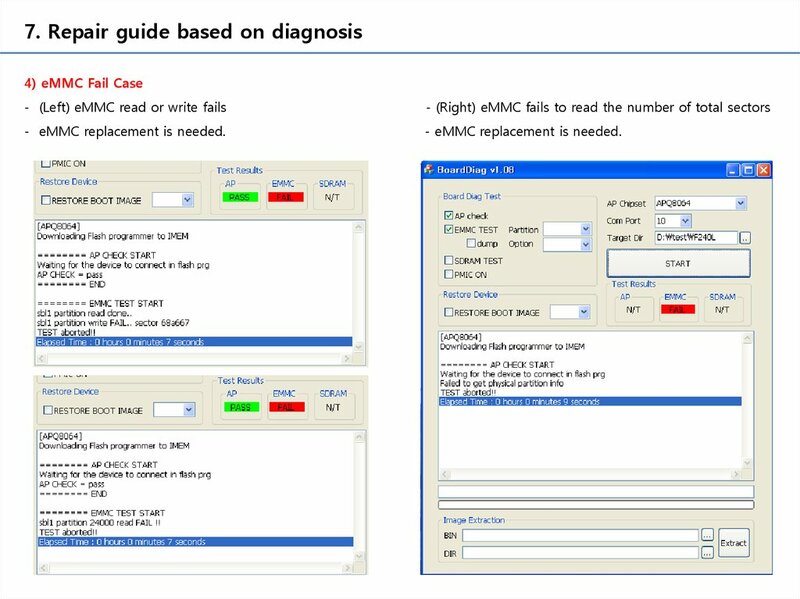 eMMC interface is used to read/write. 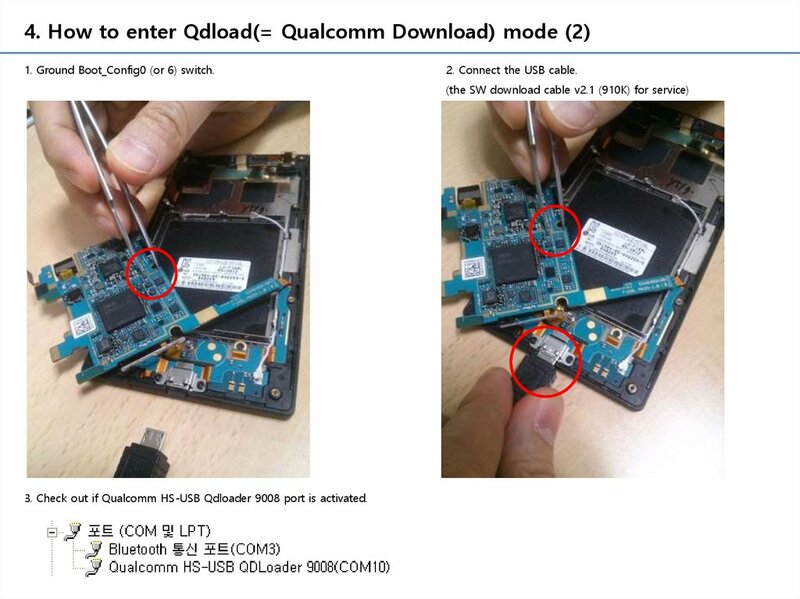 - Qualcomm QDloader USB Driver need be installed. - port or USB serial port is held. 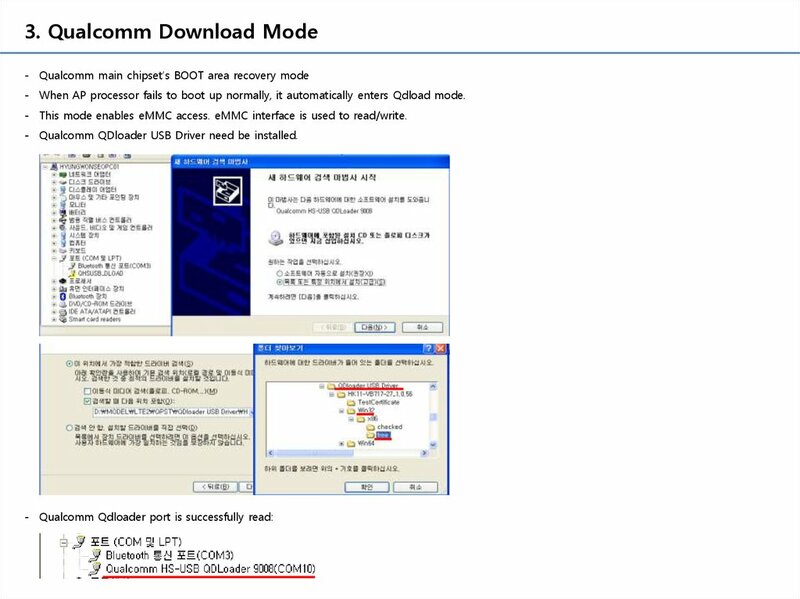 - Upon initial USB cable connection, don’t do the following if it’s already in Qdload mode. - Use either way below(#1 recommended) to connect the USB cable while the pin is grounded. - As for the USB cable, the SW download cable v2.1 (910K) for service is recommended!! Boot_config_0 or Boot_config_6 is grounded. 3 pin need be grounded. 1. Ground Boot_Config0 (or 6) switch. 2. Connect the USB cable. 3. 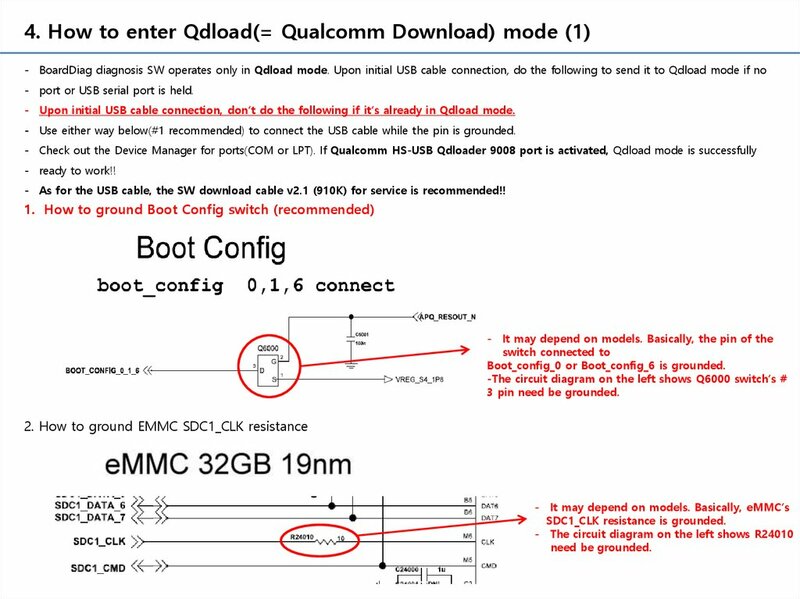 Check out if Qualcomm HS-USB Qdloader 9008 port is activated. - Ex.) As for F180L, images are extracted from LGF180LAT-00-V20j-LGU-KR-JAN-22-2013+0.tot. 2. DIR : Selects a folder to save the images extracted from the Tot file. 3. Extract : Starts extraction. 4. On completion, “Complete” pop-up appears. “Target Directory” for the model. BIN or DIR’s folder name and its path name SHOULD include English characters only. Using other characters except English or special characters will cause unexpected errors. - Partition : No need to select anything. Select it to check out a certain partition. - Option : Read Only / Read & Write (Recommended) / Erase / It can be selected while Write Only is running. - Checks out whether POP DDR memory is good. - Tick it, and selected or whole partition’s dump file is automatically created in the dump folder. - Caution : The whole partition takes much time (24+ hours). - Grant power to every PMIC power core rail. Tick PMIC on, and measure PMIC current to see if it’s good or not. - Only APQ8064 is supported but not applicable to all power rails. This will be upgraded in future versions. - Erases the existing terminal’s boot area and downloads a new Boot Image. 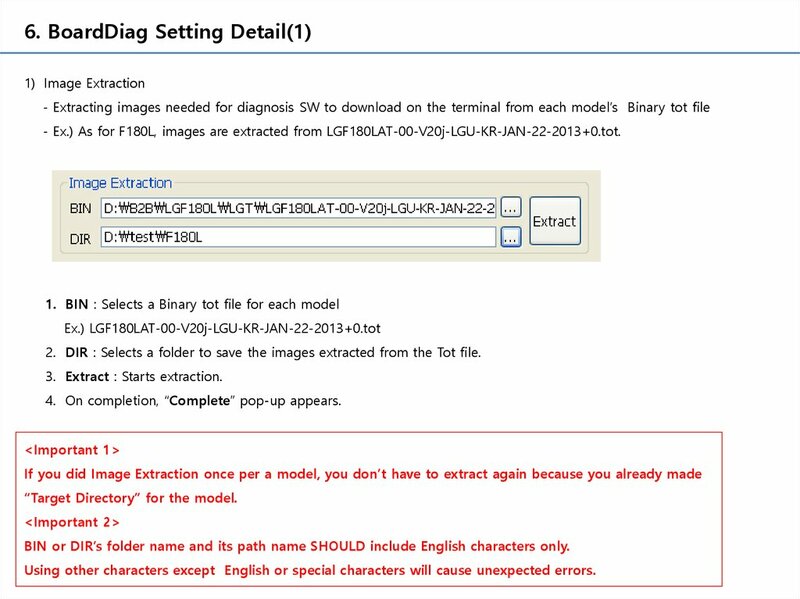 - The new Boot Image is extracted from the tot file for each model. not just in the Boot area but also in the entire area. - Select nothing, which is recommended as default. - Restore device with “misc” option if LG Flash Tool fails to download displaying PID/IMEI errors. 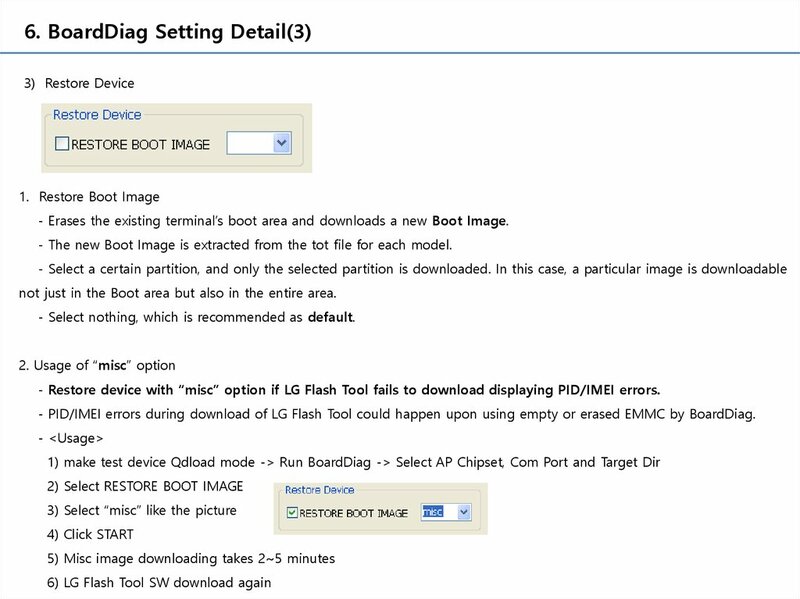 - PID/IMEI errors during download of LG Flash Tool could happen upon using empty or erased EMMC by BoardDiag. 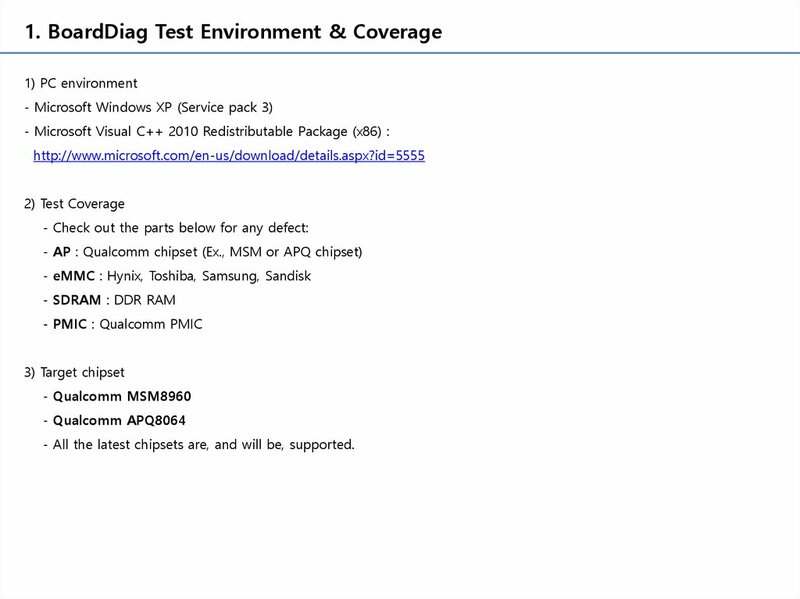 - Selects the Qualcomm chipset used by the model under testing. - Go to the Device Manager for a check. Selects the USB port # connected to the terminal. - Selects a folder to save the images extracted as in Image Extraction. 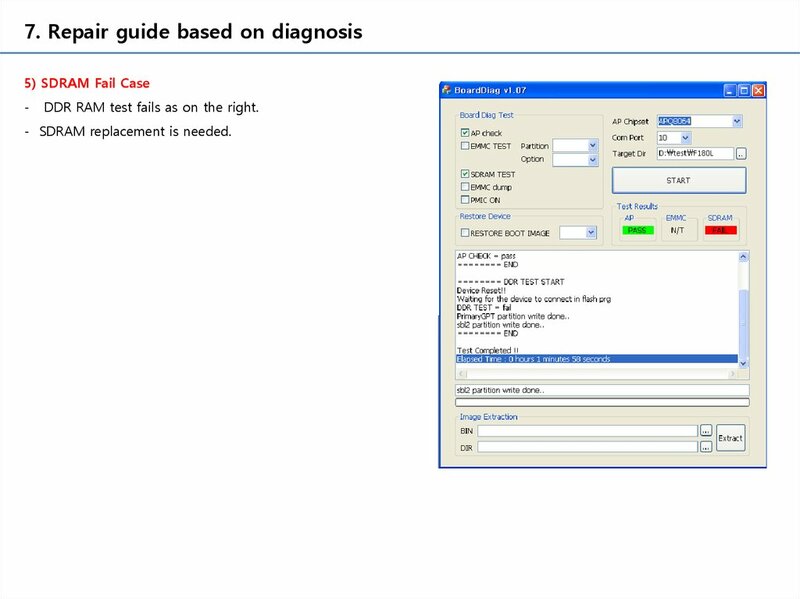 - Select all items required and click START for diagnosis. 2. The progress is displayed in the status window. 1. The result of the test selected is displayed. 2. Regardless of tests selected, AP test starts as default. - This happens when the terminal is not in Qdload mode. 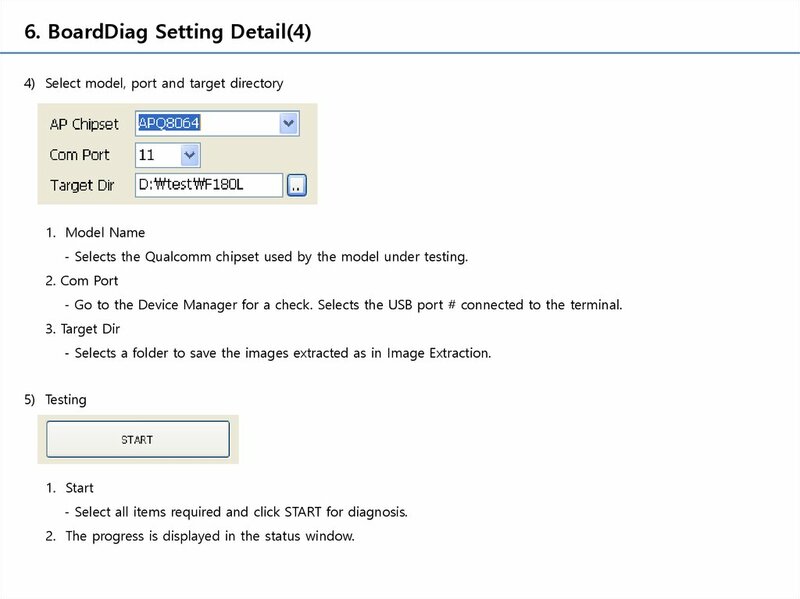 Go to the Device Manager and check out the port connection. - The message below is shown and the test is aborted. 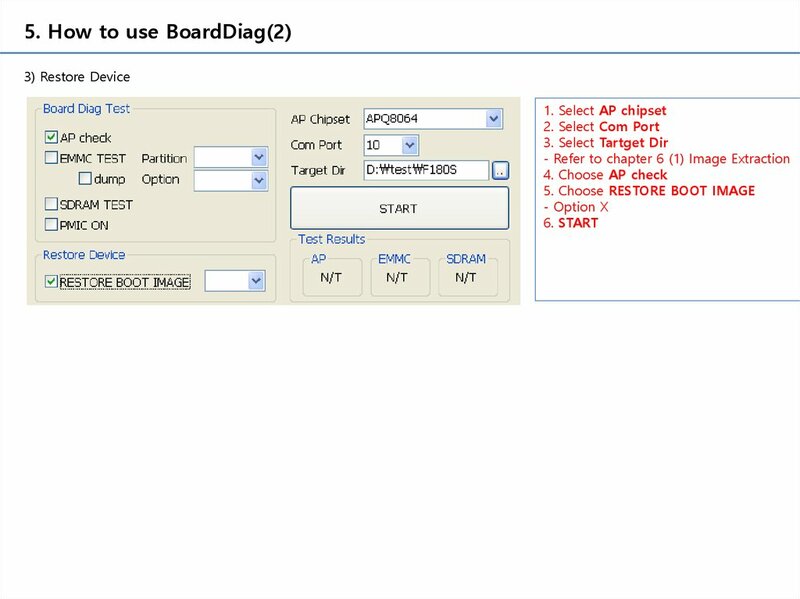 - It means that BoardDiag fails to get the response from AP. 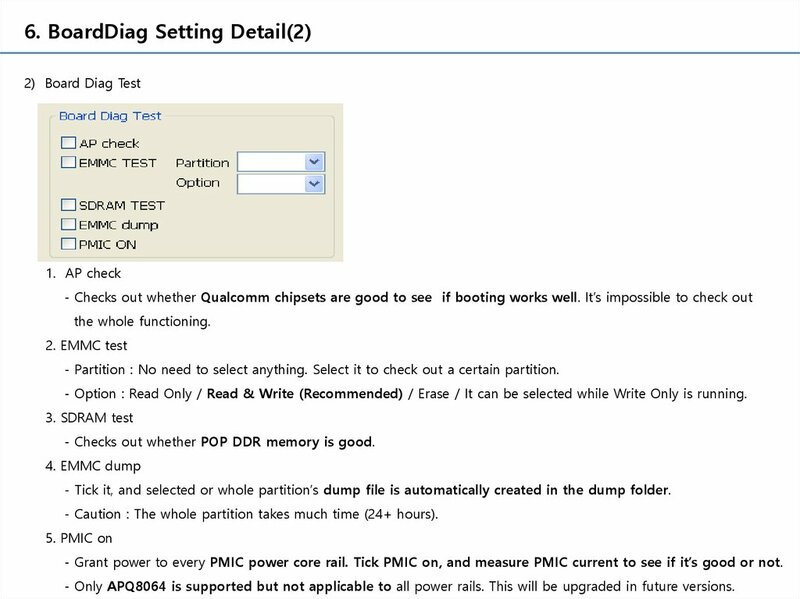 - In this case, check out PMIC first. 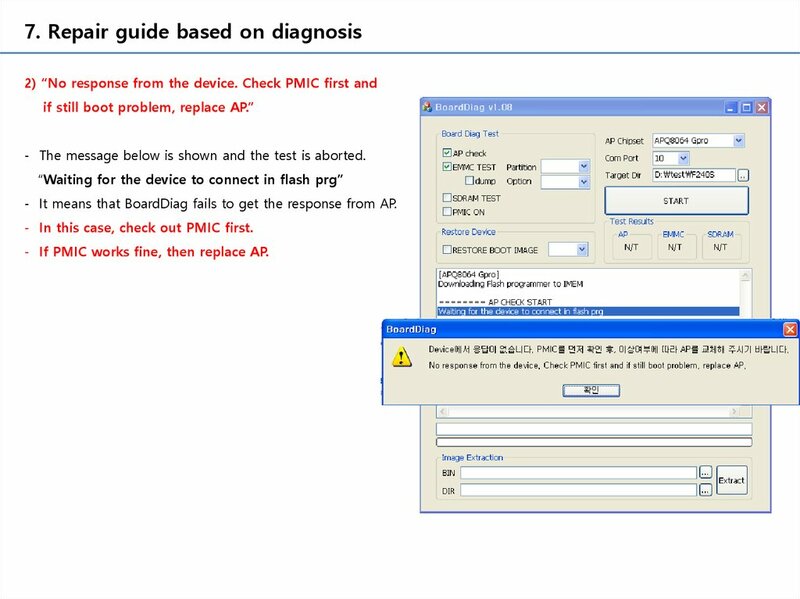 - If PMIC works fine, then replace AP. - AP fails due to two causes as below. in the RPM internal memory, AP sends no response. - This is due to defective PMIC rather than AP. Check out the PMIC power rail first. 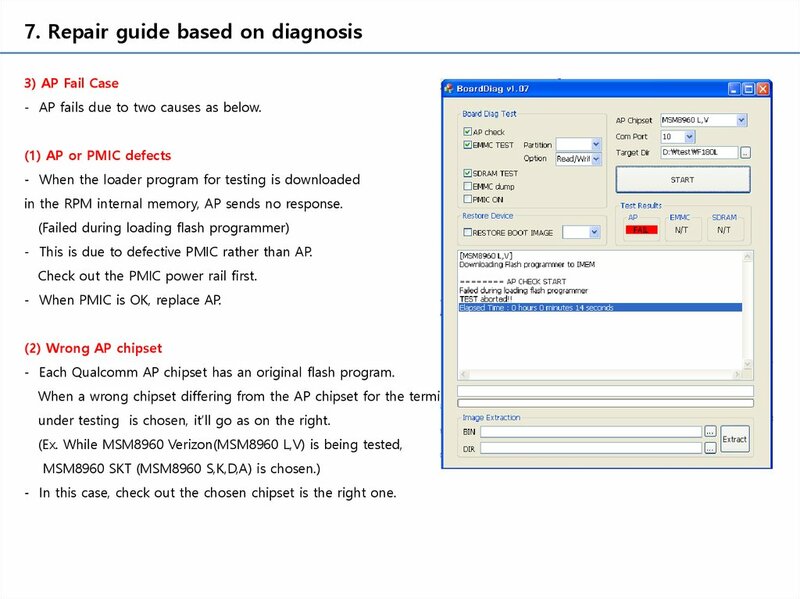 - When PMIC is OK, replace AP. 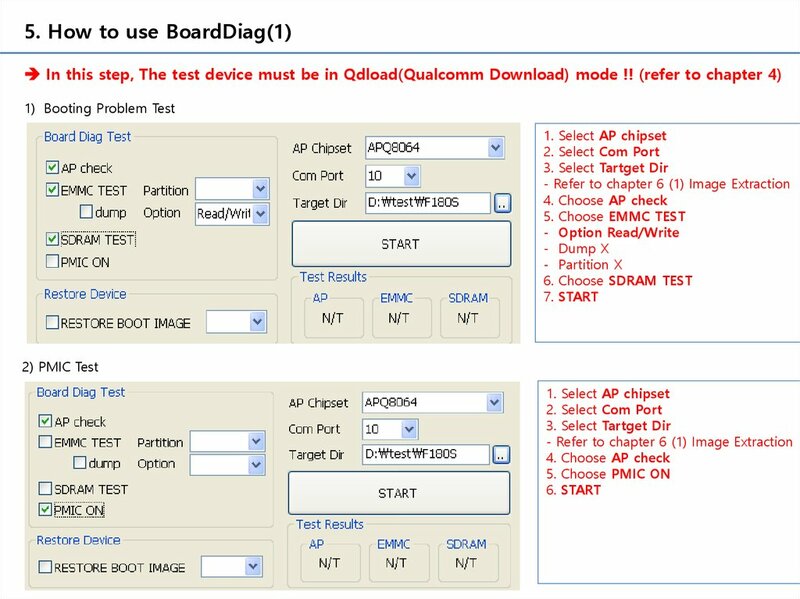 - Each Qualcomm AP chipset has an original flash program. under testing is chosen, it’ll go as on the right. - In this case, check out the chosen chipset is the right one. - eMMC replacement is needed. DDR RAM test fails as on the right. - SDRAM replacement is needed. on, PMIC pins’ currents need be measured. 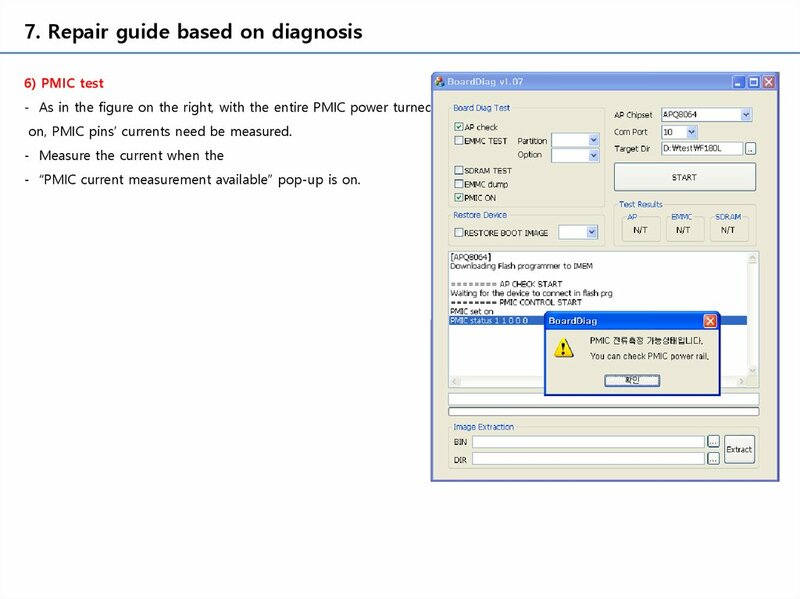 - “PMIC current measurement available” pop-up is on. 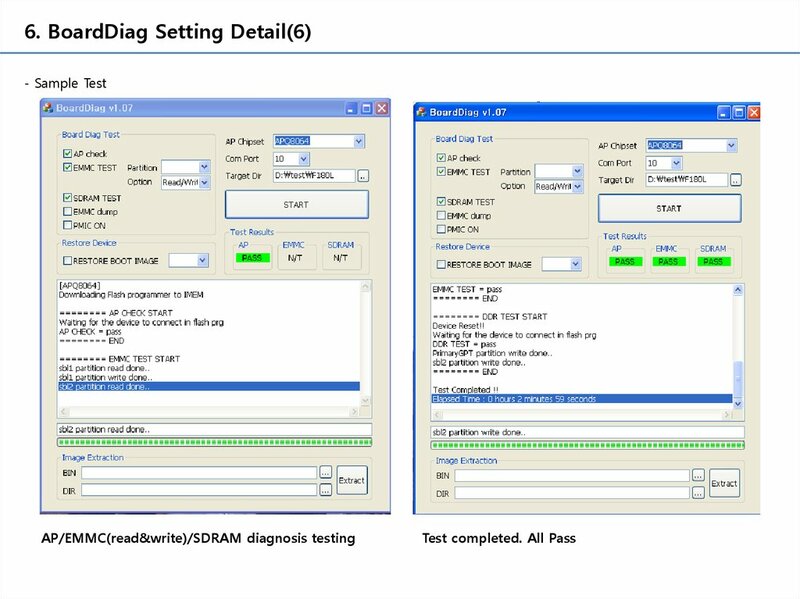 - If you perform the eMMC test only including write option except SDRAM test, Qdload mode remains after test. - It is because AA55 bit patterns are written in the eMMC boot area and original bootable codes are erased. 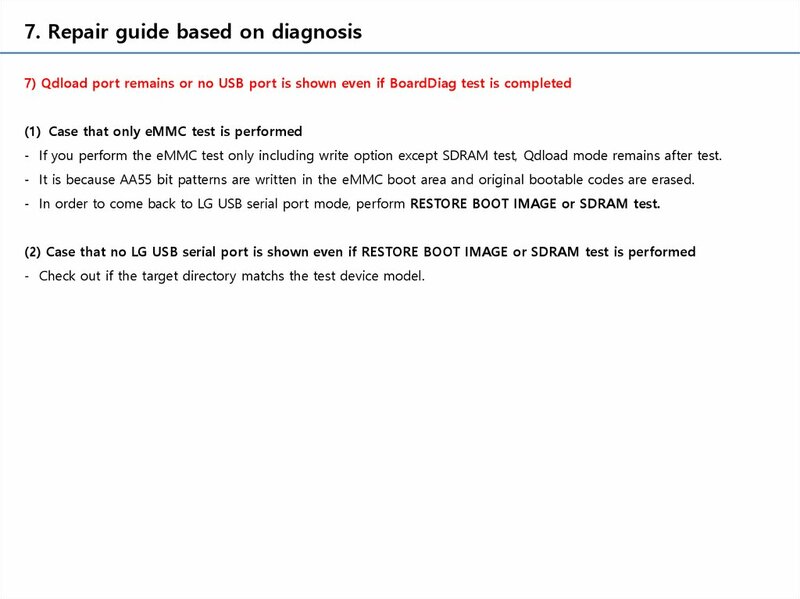 - In order to come back to LG USB serial port mode, perform RESTORE BOOT IMAGE or SDRAM test. 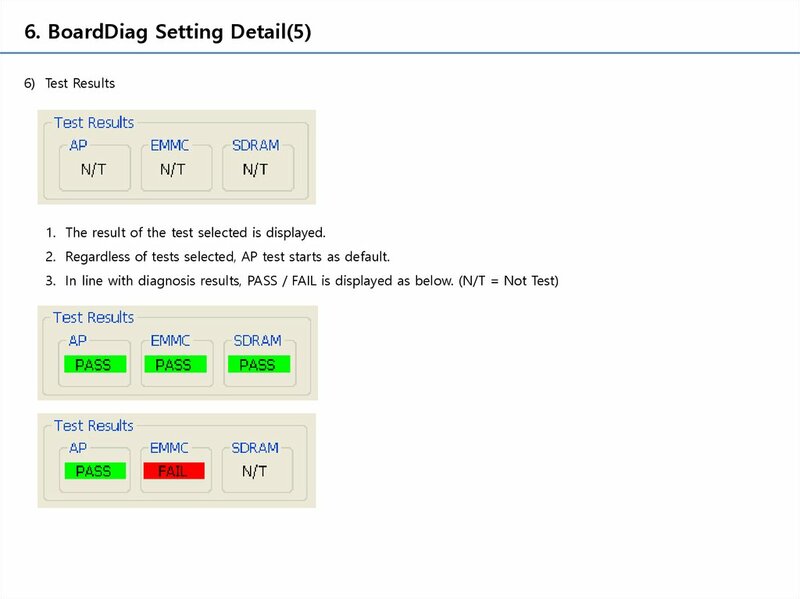 - Check out if the target directory matchs the test device model.